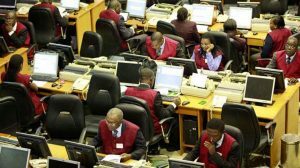 Trading activities at Nigeria’s equities market reversed its bearish performance on Tueday as gains in FBNH (+6.1%), NESTLE (+2.3%) and UBA (+6.9%) drove the All Share Index (ASI) 0.56 percent higher to 32,381.00 points. Market capitalisation also increased on the back of this performance by as much as N65.4 billion to reach N11.8 trillion, while year-to-date loss decreased to -15.3 percent. Activity level strengthened as value and volume traded inched 23.3 percent and 67.9 percent to N2.7 billion and 269.8 million units respectively. ACCESS (N679.8 million), ZENITH (N338.4million), and INTBREW (N229.7 million ) led the most traded stocks by value while ACCESS (84.9 million), SKYEBANK (22.9 million) and ZENITH (16.4 million) were the top traded stocks by volume. Performance across sectors was largely bullish as four out of five major sub-sectoral indices closed northwards. The banking index led gainers as bargain hunting in ZENITH (+2.4%) and UBA (+6.9%) drove the index 1.3 percent higher. Also, the oil and gas and consumer goods indices rose 0.3 percent apiece on the back of buying interest in FORTE (+5.3%), ETERNA (+3.3%), NESTLE (+2.3%) and DANGSUGAR (+0.7%). The industrial index eked out a marginal two basis points gain due to price appreciation in CUTIX (+2.5%). On the flip side, the insurance index was the lone loser, down 0.2 percent following sell pressures in UNIVINSURE (-8.0%) and CORNERSTONE (-8.7%). Investor sentiment improved as market breadth (advance/decline ratio) strengthened to 1.5x from 0.8x recorded the previous session as 27 stocks advanced against 18 that declined. The best performers were FIRSTALUM (+10.0%), PRESTIGE (+9.6%) and ROYALEX (+9.5%) while REDSTAREX (-9.1%), CORNERSTONE (-8.7%) and STDINSURE (-8.7%) depreciated the most. Tuesday’s rebound in the market was in line with analysts expectation at Afrinvest who say they expect the rebound to be short-lived as sell pressures persist.